In a recent Merrill Lynch study, “Home in Retirement: More Freedom, New Choices” they surveyed nearly 6,000 adults ages 21 and older about housing. 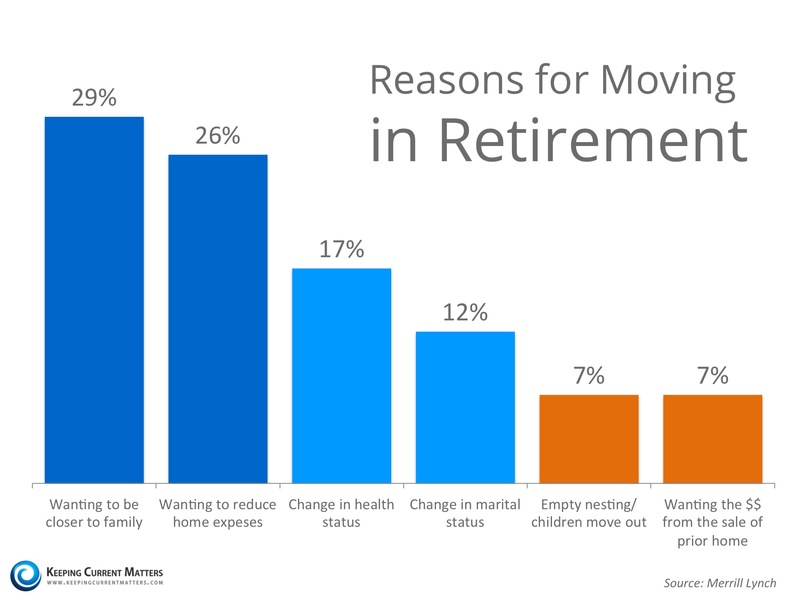 According to that study, “an estimated 4.2 million retirees moved into a new home last year alone.” Two-thirds of retirees say that they are likely to move at least once during retirement. The top reason to relocate cited was “wanting to be closer to family” at 29%, a close second was “wanting to reduce home expenses”. See the chart below from Keeping Current Matters for the top 6 reasons broken down. Find out what the best decision is for your situation! Email us at concierge@lizmoore.com, or click below, and we'll be happy to connect you with someone who specializes in senior moves!